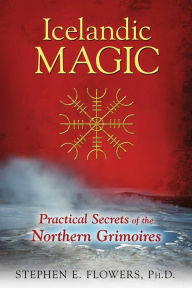 A new edition (with a new subtitle) of Icelandic Magic: The Mystery and Power of the Galdrabok Grimoire has come out from Inner Traditions. The author has published this under his real name, Stephen Flowers, as he does with his more academically-oriented works, rather than his nom de plume for magic books, Edred Thorsson. However, although a considerable amount of scholarship went into this book, this is aimed at readers who might want to actually work magic using this book as a guide, rather than academic readers. There are other translations of Galdrabok that would be more appropriate for an academic reader. As it says in the introduction, some of what’s in this book is from historical sources and some is the author’s gnosis, included as examples of how to create a personal spellbook from a combination of historical grimoires and one’s own experience. Flowers starts out by saying the book the reader is holding is a magical object, and will be imbued with increasing power when the reader adds his own magical writing to it in the working sections. Since I was reading an eARC (electronic Advance Reading Copy), the idea felt a bit odd. I don’t think I really want my Kindle to be an object of power. However, I recognized that this is traditional with handwritten spellbooks. There is a long section on the history of witchcraft in Iceland. Then there is a history specifically of magic books. Famous historical figures practiced magic. Although there were reputedly good and evil magicians, magic itself was considered neutral by magic users. All kinds of spells were collected by both good and evil spellcasters. There are two famous magical books, Gray Skin and Red Skin, named after the color of the leather in which they were bound. The book Red Skin was considered an evil book. After the rise of Protestantism, Icelandic mages mixed heathen gods, Catholic saints, the Christian god and devil, Christian demons, and imported classical pagan gods from the Greco-Roman pantheon, in magical chants and workings. Icelandic magicians used many magical signs, some of them based on runes and some not. The rune-based ones appeared as bindrunes, or as stylized symbols that developed out of bindrunes over time. The spells in magical books such as Galdrabok often had both a sign to write and a chant or spell to recite out loud. Sometimes the chants were specific to the working and sometimes magicians used the Christian Lord’s Prayer, which appears in an appendix of this book. This book includes some selected lore stories about various historical mages. Most were learned men and respected Christians. Some of the stories are fun, some sad, and some horrifying. Flowers explains the theory and practice of the use of Icelandic sign magic clearly, with step by step rituals and illustrations. There are many interesting signs, and a lot of historical and theoretical information about them. For example, the mysterious Helm of Awe: what it is, why there are variations to its form, and the idea behind why it looks that way. The different traditional signs are called galdor signs. Galdor means chanting, so writing the sign and saying the chant that goes with it were integral parts of casting these spells. Jadfadhr, “yellow-brown bear” [for works of strength]. Another appendix lists traditional magical signs along with their names. I was amused to see among the signs, “book-learnings.” Suddenly country people’s suspicion of book learning makes historical sense. Book learning is that which comes out of magical books like Galdrabok. To know book learning is to practice witchcraft. Some of the signs and names make obvious sense, but many don’t. They would require explanation before one could work magic with them. Others I understood immediately and wished I hadn’t. For example, there is a magical sign named after the god Baldr that looks like something with a spear through it. That is not a magic I would ever want to work. There are multiple galdor signs that reference Baldr, in fact, more of them than for any other heathen god save Odin, the very god of magic and runes. It makes sense that in a Christopagan magical system they would focus on the heathen Sacrificed God or Dying God figure as analogous to Christ. Still, many of the signs’ meanings are occult in the sense of having a hidden meaning in addition to the sense of being magical. Even the ones where the symbol and the name makes sense with each other don’t necessarily suggest a practical use. Taking this list of traditional signs and their names and explaining what each of them mean and what people used them for would be an excellent direction for future scholarship. Icelandic galdor sign magic is an exciting, unique magical system. This system comes directly from historical forms of magic that were in continuous practice right up until the 20th century. However, it’s not a folk magic, as it was not practiced by village witches, but by the educated elite, often Christian clergy in important positions within the church. It’s very nearly a naturally grown Christopaganism. Some steps that would be required for total beginners to using magic are absent from the book. For example, instructions on exactly how to visualize a two dimensional sign in four dimensions, which is stated as a requirement for making the signs work without going into any basic visualization exercises. So, this book is for the intermediate to advanced practitioner of magic. I recommend this book for witches, pagans, and especially heathens, who already have some basic foundation in magic and are interested in learning another magical system. I highly recommend this book for anyone interested in seeing how a system of Christopagan magic works within a cultural framework that allowed it to grow over time. I also highly recommend this book for Asatruars interested in learning about the history of survivals of heathen culture in post-Conversion Iceland.